For a long time, Budapest was one of the best-kept secrets in central Europe. Backpackers looking for cheap and hostels flocked to the city. Experienced “in the know” travelers raved about Budapest. In the last decade or so, that’s all changed: Budapest is no longer just for backpackers, and it’s no longer a secret. While it’s still not as busy as nearby Prague or Vienna, the secret is out. And as it turns out, luxury travelers LOVE Budapest. Hungarian wine – with its nearly-incomprehensible 22 wine regions – is a fantastic value. The city is full of cultural treasures and upscale nightlife. High-end international and Hungarian brands make Budapest an excellent stop for a shopping trip. And the city’s restaurant scene is exploding. Add to that, Budapest is filling up with gorgeous luxury and upscale boutique properties. If you want to stay in one of the best Budapest 5 star hotels, we’ve done the research for you. In this article, we compare 16 5-star Budapest hotels. 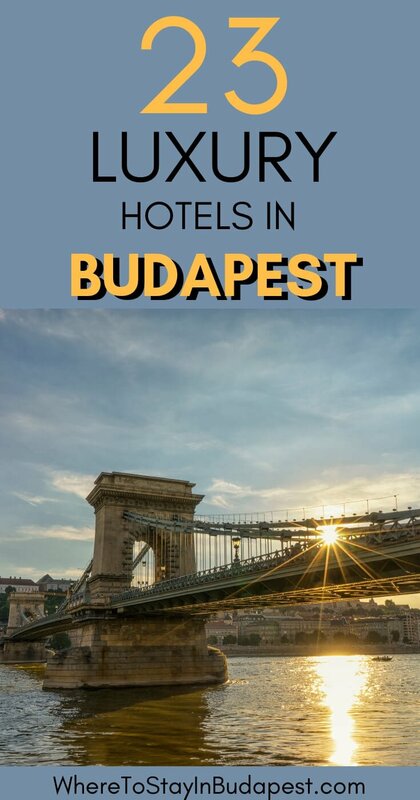 We also compare 7 deluxe hotels in Budapest. These are hotels that have a gorgeous, boutique vibe to them, despite a 4 star hotel rating. Consider this an overview post to save you time. We’ve summarize the best features of each property. And we’ve done our best to present it in a way that’s easy to digest. Hopefully, it makes it easy to choose one of the best 5 star hotels in Budapest for your own trip. We hope this round-up of the top hotels in Budapest helps you with your trip planning. And we hope it helps you find the best option for your holiday in Budapest. Aria boasts a location in one of the best areas to stay in Budapest n steps from St. Stephen’s Basilica in Budapest’s 5th District (in Pest). It offers a gorgeous rooftop terrace and bar and a well-reviewed fitness center and spa. All guests are welcome to enjoy the included, well-reviewed breakfast. There’s also an afternoon wine and cheese experience featuring Hungarian wines. Additional inclusions are all-day coffee, tea, and fruit; turndown service; a heated pool, steam room, pool and jacuzzi; and more. And don’t even think about skipping the gorgeous rooftop bar! That’s not even mentioning it won 2017 Best Hotel in the World in Trip Advisor’s Traveler’s Choice Awards. All this means it’s hard to go wrong with The Aria. Impeccable from start-to-finish. Presidential Suite at Four Seasons Gresham Palace Budapest. Photo – Four Seasons Hotels and Resorts. Used with permission. The Four Seasons has a scenic, convenient location at the Pest-end of the famous Chain Bridge. Staying here ensures you’ll have easy access to the best of what Budapest has to offer. Rooms are tasteful and elegant. The hotel is housed in a gorgeous Art Nouveau palace dating back to 1906, restored in 2004 following a 5-year, $110-million project. Guests are welcome to enjoy the indoor pool, spa, and fitness center. Travelling families will love the children’s and specific family amenities. Other amenities and services include what you’d expect of the Four Seasons brand. If available, consider splurging on a Danube-view room. #YOLO. Photo Courtesy of The Corinthia Hotel Budapest. Used with permission. 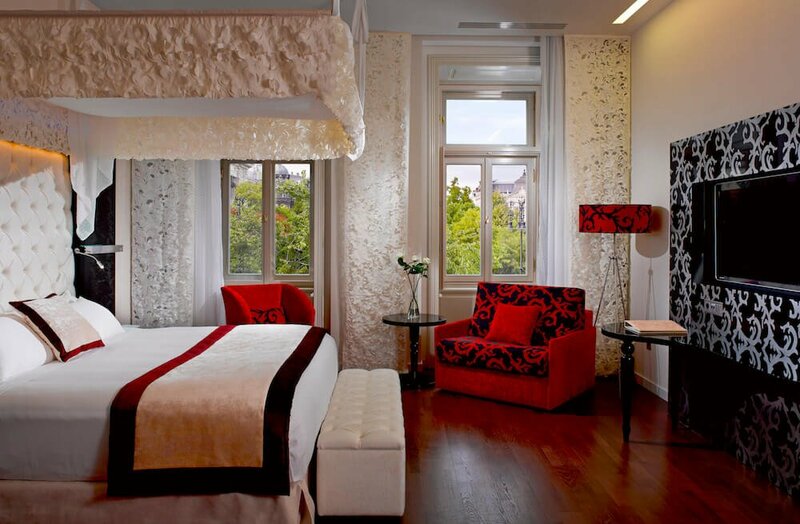 The Corinthia has an elegant home on Budapest’s Grand Boulevard in Budapest’s 7th District in Pest. It offers an impressive array of amenities, in addition to being beautiful. Beginning life as the Grand Hotel Royal in 1896, the original property was French Renaissance style. Restored, reimagined and reopened in 2004, it’s now a guest’s delight. Rooms look contemporary and elegant. Expect a warm, modern ambience and subtle Art Deco nods. The Royal Spa is a destination in itself. Housed in a beautifully restored Art Deco space, the swimming pool, jacuzzi, steam bath, and treatment rooms will have you relaxed in no time. For those wanting to keep fit on holiday, there is also a fitness centre. If you’re a film or cinematography buff, The Corinthia has a fun connection! It’s apparently one of Wes Anderson’s inspirations for The Grand Budapest Hotel. Photo Courtesy of Iberostar. Used with permission. The Iberostar sits at the southern end of Szabadság tér (Freedom Square) in Pest. It’s one of Budapest’s prettiest neighborhoods, and is within easy reach of attractions. From here, you can walk to the Danube, Chain Bridge, Parliament, Basilica, and Opera. The interior is modern and sophisticated, created by renowned French designer Philippe Starck. Expect 5-star amenities such as a pillow and scent menu! Past guests mention great staff service and comfort as stand-outs at this property. There’s a gourmet restaurant and on-site bar, as well as fitness and spa facilities. The New York Palace sits on Pest’s Grand Boulevard. This ring road runs around downtown, making it a convenient part of the city. 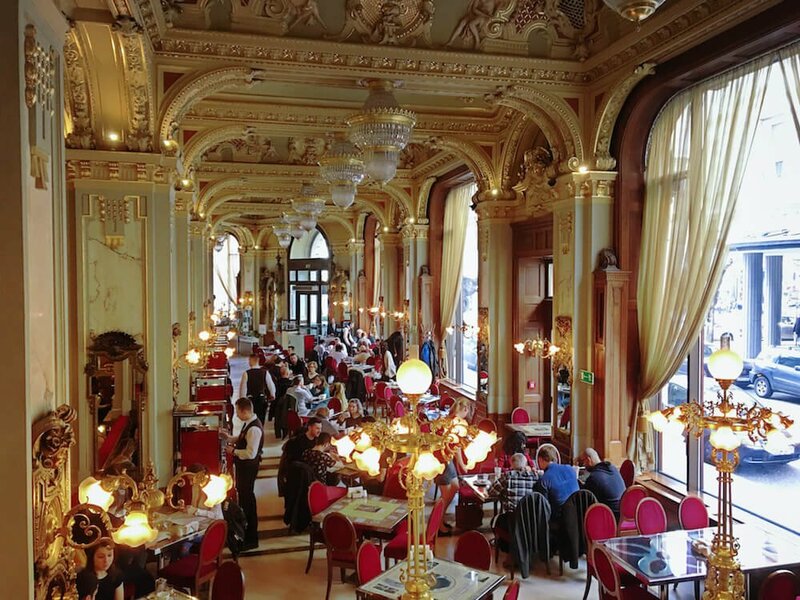 The hotel is home to the stunning New York Cafe, and oozes old world elegance inside and out. Beauty and wellness options include a beautiful relaxation pool, spa treatments, a salon, and a fitness room. The on-site New York Cafe is sometimes touted as the most beautiful cafe in the world. You can also choose from Salon Fine Dining, Nyugat Bar, and a separate breakfast room. 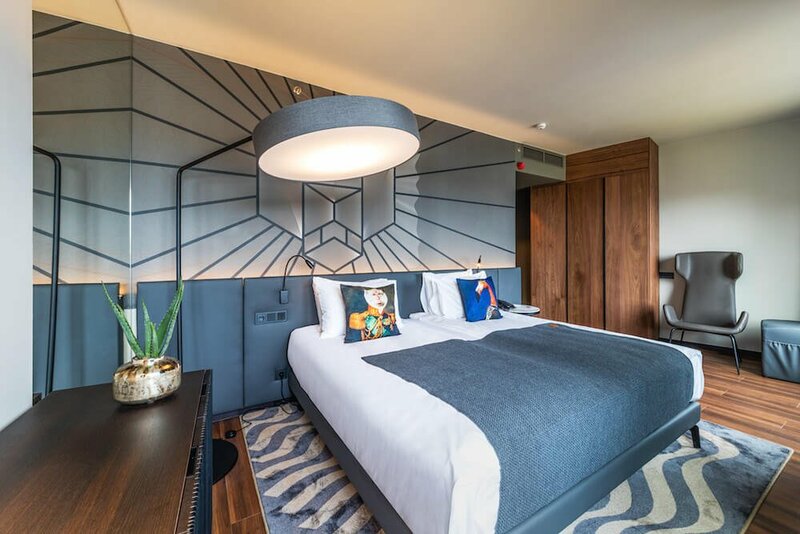 A recently refurbished room at the Kempinski. Photo Courtesy of Kempinski Hotel Corvinus Budapest. Used with permission. Located at the ultra central Deák Ferenc tér (square), it’s hard to beat the Kempinski’s location. Staying here, you’ll be smack dab in the city centre and in the heart of Pest. That means easy access to the city’s best restaurants, bars and attractions. Rooms have an old-world elegance to them, although the hotel is slowly making some of the rooms more contemporary. The Kempinski has two restaurants on-site. The smart-casual ÉS bistro offers local classics. Nobu serves Japanese-inspired cuisine and sushi. There are also several bars and cafes. The hotel also features a spa, pool and fitness area for wellness and relaxation. 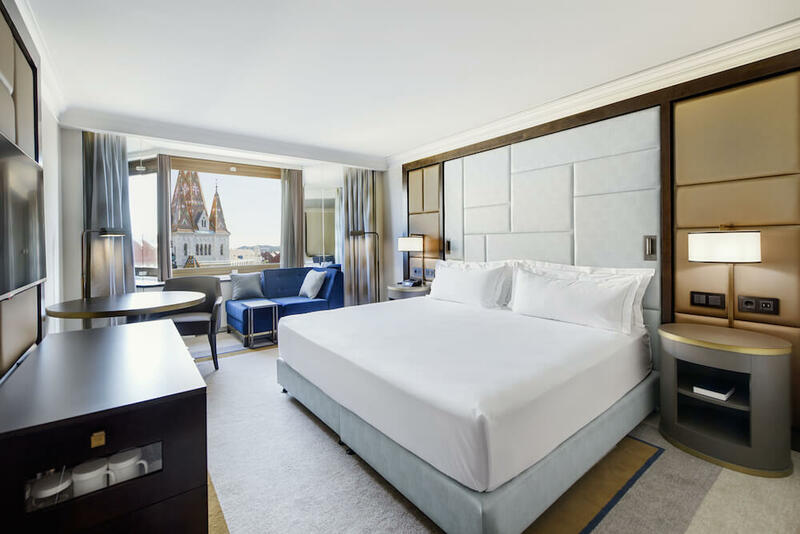 Read a more detailed profile of the Kempinski Budapest here. Photo Courtesy of Intercontinental. Used with permission. The InterContinental has a lovely riverfront location south of the Chain Bridge. Besides being in a beautiful location, it’s also central and convenient. The hotel has an understated, calming look, with muted colors throughout. Guests can enjoy on-site dining at Corso Bar and Terrace. In nice weather, the terrace is the place to be for riverfront dining. Wellness options include a pool and fitness facility. 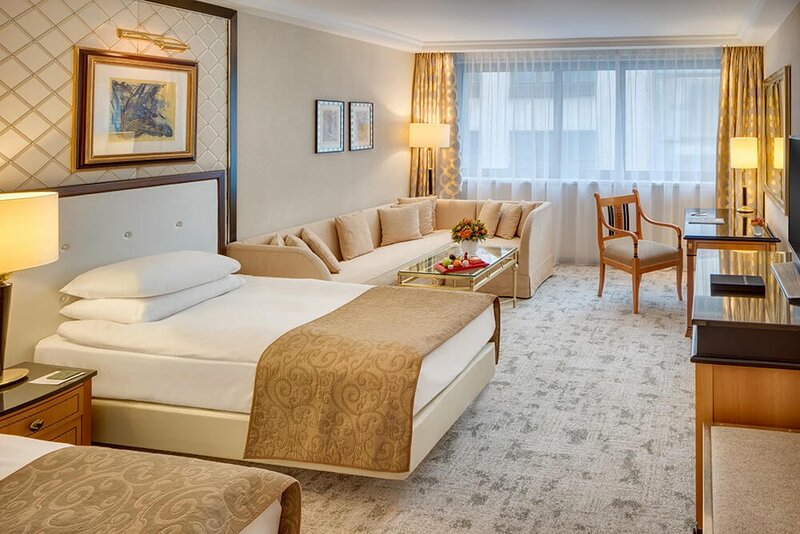 Danube-facing rooms offer spectacular views of the Chain Bridge and Buda’s Castle District. This is a luxury option in the heart of Budapest’s gorgeous Castle District. This property has an old world, aristocratic air to it. You may leave feeling a bit more regal! Room decor nods to the Austro-Hungarian Empire. They are generously sized, giving you room to spread out. In nice weather, there is a lovely garden restaurant to relax in. Guests can enjoy the St. George Restaurant and Cafe interior when it’s too cold for outdoor dining. Located on Budapest’s Castle Hill, there are gorgeous views to be had all around. The neighborhood also has plenty of quaint streets to wander. This hotel in the heart of Buda Castle District offers gorgeous views steps from the front door. If you’re lucky, you’ll also get great views from your room. 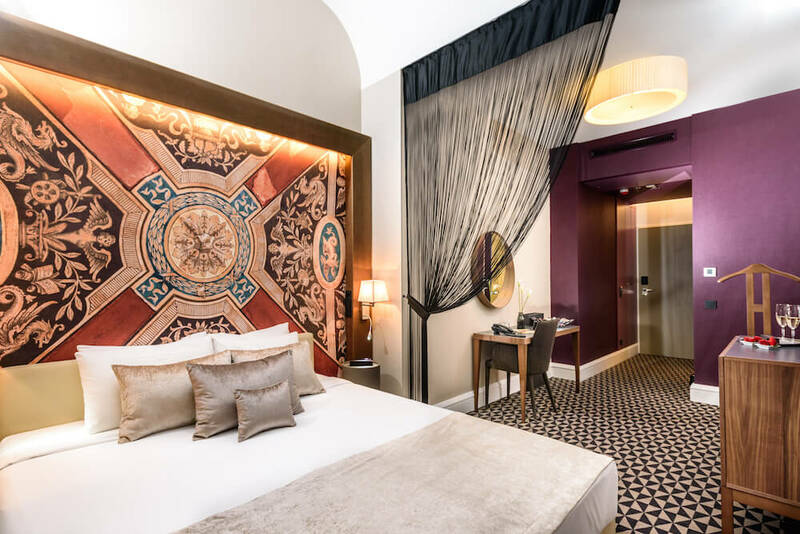 Steps from Fisherman’s Bastion and Matthias Church, this hotel offers easy access to Buda Castle, Changing of the Guards, the History Museum, and the National Gallery. Pest’s city center and the famous Chain Bridge are only a short walk away. Enjoy spectacular views of the Danube from the 24-hour fitness center, or book a room with its own view. Icon Restaurant serves a Hungarian and Mediterranean menu. There’s also a Lobby Cafe & Bar available for a casual drink. 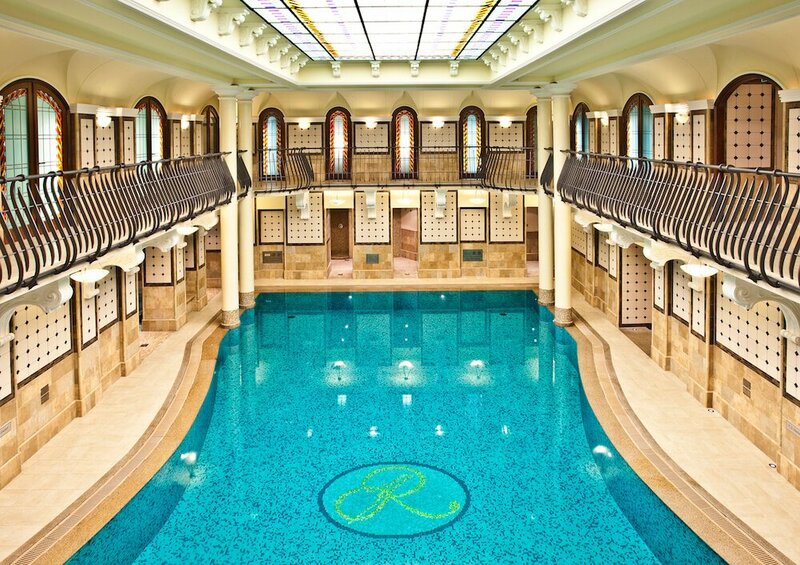 The Ritz sits in a 20th-century building in the heart of Budapest’s city center. It offers a modern twist on traditional luxury, with all the amenities you’d expect from this brand. Located on the edge of Erzsébet Square, you’ll be able to walk to many attractions in minutes. St. Stephen’s Basilica, the Danube, and Vaci shopping street are particularly close. Some rooms offer stunning views. Others offer small balconies with panoramic views of the city. Start your day with an abundant breakfast at The Kupola Lounge, known for its stained-glass cupola. Wind down with one of many relaxing treatments at the spa. The spa has a hot tub, steam room and swimming pool bathed in natural light. Indulgent! 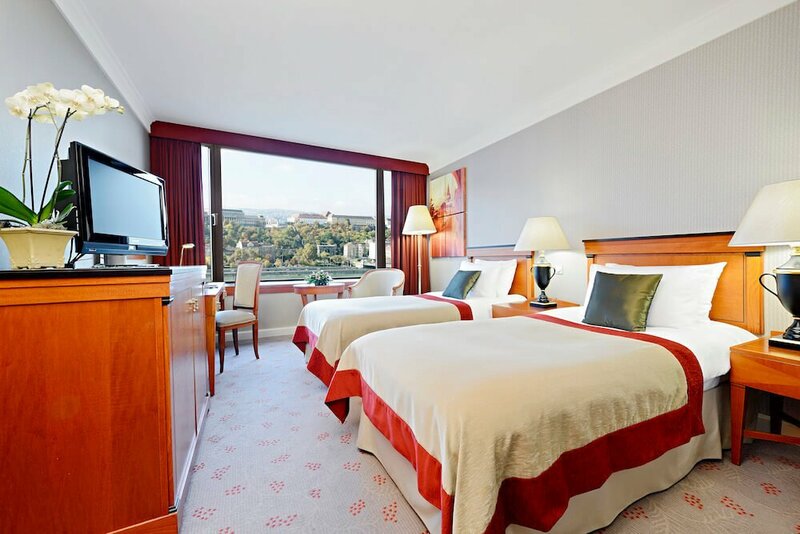 The Sofitel sits in a fantastic location on the Danube, steps from the Chain Bridge. It’s also within an easy walk to many other top Budapest attractions, and you can take the Castle Funicular up to the Castle District. The hotel has plenty of drinking, dining and relaxing options. Choose the sun terrace for gorgeous views of the river. Relax with a cocktails at the Paris Budapest Bar. Or enjoy French-Hungarian cuisine paired with wine at Paris Budapest Restaurant. Other dining options include Terrasse Restaurant, which offers breakfast and private dining. The luxury spa features a full range of treatments and beauty products. 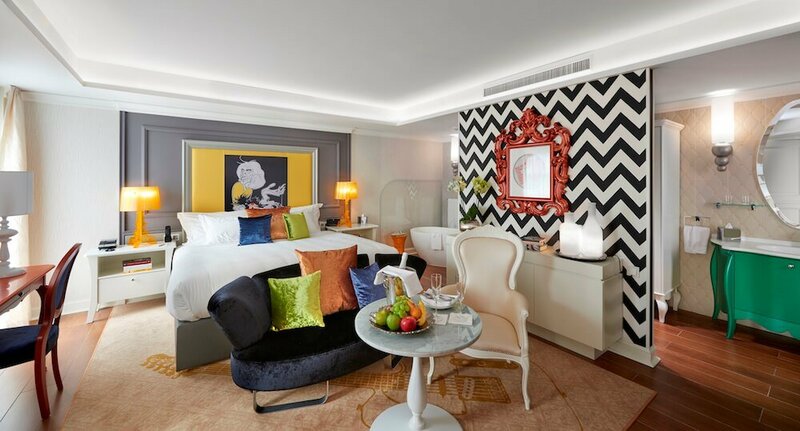 The Sofitel’s interior scheme was created by French designer Jean-Phillippe Nuel. The luxurious interior contrasts with the brutalist exterior of the building. It’s a striking juxtaposition. The Marriot is another one of Budapest’s Danube-front hotels. It’s conveniently located in the city centre, and is an easy walk to the Chain Bridge. You’ll also be able to walk to many other central attractions from here. On-site dinking and drinking includes Peppers! Mediterranean Grill and the AQVA Lounge Bar. The fitness centre offers a few classes, if you prefer organized fitness. And after a day of exploring the city, the sauna, whirlpool and jacuzzi are the perfect indulgence. The New York Residence offers 5-star suites in central Budapest. It’s relatively close to Andrássy Avenue and Hungarian State Opera. It’s also well-located for getting to the Széchenyi thermal spa baths. The Residence offers a wide range of comforts. Expect a fully equipped kitchen and dining area, a lounge with flat screen TV, and high-speed internet. Past guests have particularly enjoyed the 2-story suite with panoramic terrace! Hop over to the New York Palace Hotel to experience the hotel’s amenities, including the spa and fitness center. Experience a delightful meal at the historic New York Cafe or sip cocktails to the sounds of a live piano at the bar. Queen’s Court is another luxury apartment-hotel option. Conveniently located in the city center, it’s good option for those who want some comforts of home. The property includes a spa and fully equipped gym, indoor pool, dry sauna and jacuzzi. Enjoy a drink or quick bite to eat in the courtyard and garden during the summer. Chess Restaurant and Bar features a mix of French, Italian and Hungarian cuisine and fine wines. The Hilton City is attached to the West End Shopping Center in Budapest 6th District, on the Pest side of the Danube. It’s about a 15-minute walk or 1 tram stop from Andrássy Avenue. As such, it’s within easy reach of Parliament, Heroes’ Square and St. Stephen’s Basilica. If you’d prefer to explore on two wheels, there are rentals available onsite. The fitness center has a sauna, and offers nice views of the area. Grab a cocktail, meal or coffee at the Arrabona Restaurant or Zita Cafe. You can also access fast-casual restaurants within the shopping centre, such as Vapiano (Italian). Photo Courtesy of Hotel Moments Budapest. Used with permission. Hotel Moments has a location that can’t be beat. Sitting on UNESCO-listed Andrassy Avenue, it’s steps from the Opera. It’s also an easy walk to the Basilica, Chain Bridge, and Váci Utca shopping street. The hotel’s home is the former Schossberger Palace, which has been beautifully renovated. What used to be the Palace’s central courtyard is now protected from the elements with a glass roof. Natural light streams in, creating an airy, modern common area. Guest rooms are arranged around this central courtyard. 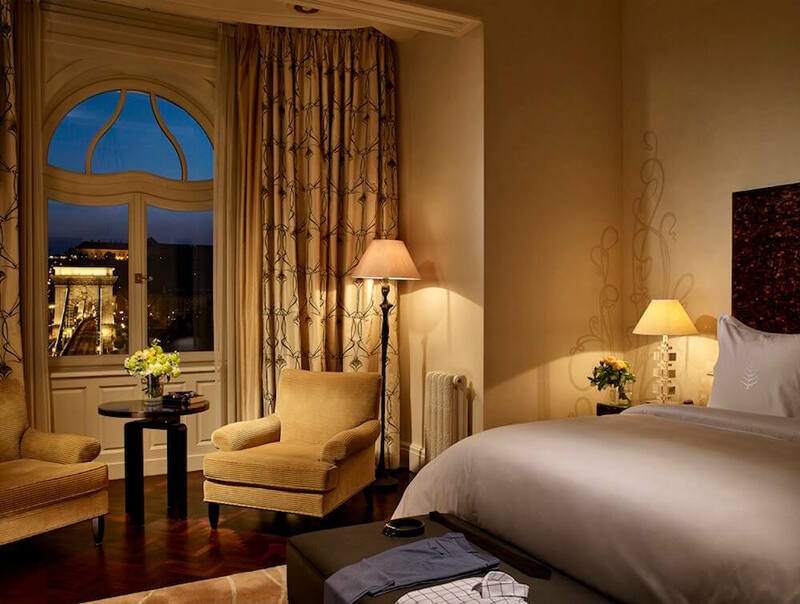 If you really want to splurge, the Andrassay Suite offers stunning views of the Citadel and St. Stephen’s Basilica. The Basilica Suite has an open terrace overlooking the Basilica. Bistro Fine features Hungarian specialties and over 100 quality wines to choose from. The small on-site fitness center with sauna is adequate for keeping up with your wellness routine. A beautifully renewed property in an exceptional location. The Prestige Hotel sits within a neoclassical 19th century town home. Reconstructed in 2014, it’s a beautiful and sophisticated property. Its location close to the Basilica ensures you’ll have a great base in Budapest. The Prestige is home to Michelin-starred Costes Downtown. Earning the star less than a year after opening, the restaurant has been named the 25th best in the world by TripAdvisor. The on-site fitness center, dry sauna and jacuzzi make up the relaxation and wellness offering. Maison Bistro and Hotel is an upscale boutique with only 17 rooms. Housed in an elegant building dating back to 1464, you’re sure to love the historical ambience! Each room is individually decorated. They have a bright and fresh ambience, combining playful and modern decor with the building’s history. There is a delightful bistro onsite, as well as an impressive wine cellar under the building. When the weather is nice, the garden courtyard is the perfect spot to take a break from your exploring! Maison is located in the heart of Buda Castle district. It’s within walking distance to Fisherman’s Bastion and Buda Castle. Family-owned Pest-Buda Hotel and Bistro is a quiet, romantic option. It’s located in the Castle District near historic sites like Matthias Church. The building also has a long history: it served as a hotel way back in 1696. Although the building has been through many iterations, it claims to be the oldest hotel in the country. Modern renovations also make it one of the most stylish in the city! Enjoy traditional Hungarian cuisine in the cozy Pest-Buda Bistro. In the warm months, the terrace is charming. Guests can choose from 10 unique rooms and suites. Each has a luxurious and modern feel. 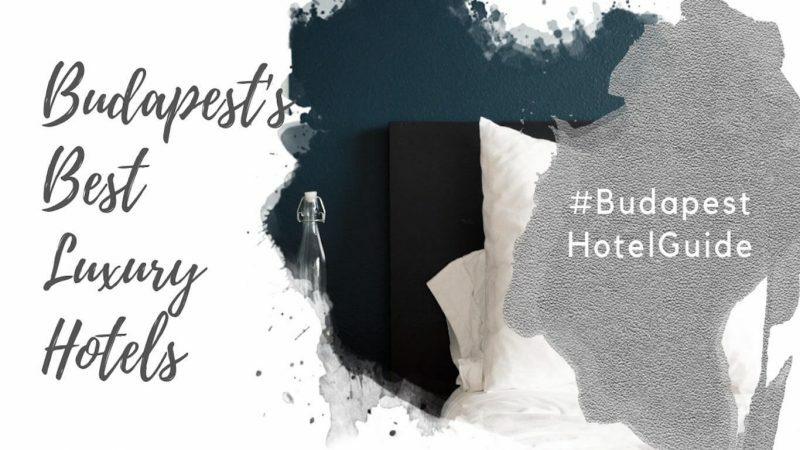 Read our detailed Pest Buda hotel profile here. Baltazar is located in the Buda Castle District. Choose from 11 bohemian-styled rooms and suites, with quirky touches and nice views. Request the suite for your own private terrace overlooking Kapistran Square. Baltazar Grill has an eclectic menu. Choose from charcoal-grilled meats, Hungarian classics, and burgers, among others! The restaurant also boasts a cobblestone terrace and a selection of top gins. The hotel’s wine bar, specializing in central European wines. Past winner of the Best Small Hotel in Hungary on TripAdvisor. Callas House sits in an architectural monument built in 1881. It’s a perfect choice for classy accommodation in a prime location. Sitting next door to the Opera, it’s surrounded by cafes and restaurants. All-day dining can be found at Callas Cafe & Restaurant. Sit on the terrace for views of the Opera and Andrassy Avenue. Choose from uniquely designed rooms and suites located on the top floors of the building. Photo Courtesy of Hotel Clark. Used with permission. The Clark sits on the Danube River right next to the Chain Bridge. Talk about a prime location! It offers easy access to iconic Budapest attractions and is steps from the Buda Castle funicular. Luxury rooms, a Finnish dry sauna, and a fitness room with scenic views of the city are some of the amenities. The Beefbar Budapest serves an assortment of cured, cooked and raw meats. The hotel bar, Leo Budapest, welcomes guests on the gorgeous rooftop terrace from spring to fall.